Yalieth Gonzalez and her baby Micaela Delgado at the Maternal Infant Studies Center at the University of Puerto Rico. Micaela Delgado is a beautiful dark-eyed baby girl with a ready smile. She's 8 months old. She's one of more than 1,000 babies already born in Puerto Rico to mothers with Zika. Her mother, Yalieth Gonzalez, 22, says despite all her worries, so far Micaela's development appears normal. "She's very active, she's up on her own now, she's crawling," Gonzalez says. "She's saying, 'mama' and 'papa' already. She's a very happy baby. She has a lot of energy." But Gonzalez is on alert for signs of trouble. Gonzalez doesn't know how she got Zika, which is spread by mosquitoes. She was just three months pregnant when she had symptoms and went to the hospital. Doctors monitored her baby's development with regular ultrasounds and warned her about the possibility of birth defects. The worst part of her pregnancy was her delivery. Gonzalez says she was in labor for 22 long, agonizing hours and she spent that time worrying. "'What would I do if she was born with health problems?' I thought. I was young. What would my life be like? I wanted to see her, but at the same time, I was scared, scared of how I would feel if she was born with medical problems." Since Zika appeared in Puerto Rico more than a year ago, doctors believe as many as a million people on the island have been infected. Some 40,000 of those cases have been confirmed, a number that includes some 3,200 pregnant women. Doctors in Puerto Rico are just beginning to assess the long-term consequences for children born to mothers with Zika. Yalieth Gonzalez was treated at the High Risk Pregnancy Clinic at the University of Puerto Rico's hospital. Dr. Alberto de la Vega has seen one-fifth of the pregnant women on the island who tested positive for Zika. "Among those patients we've had at least 14 or 15 confirmed cases in which severe brain damage, caused by the Zika virus, has occurred," he says. Some of those cases included microcephaly. For babies born to mothers infected in the first trimester, de la Vega says the risk of brain damage is between 2 and 4 percent. But he's seeing many other problems in his patients infected with Zika, including mothers going into premature labor and a higher number of miscarriages. What worries him most is that even in cases where babies appear normal, their brains show lagging growth. "What does that mean in terms of future development? No one has an idea," he says. "If you have a condition that can cause severe brain damage, it's not going to be an either-or situation. There has to be a spectrum of problems that are yet to be defined." De la Vega and other doctors are also concerned about young children who contract Zika after birth, at a time when their brains are still actively developing. Puerto Rico's Health Department plans to monitor these children for three to five years. Many are being seen at the University of Puerto Rico by Dr. Carmen Zorrilla. She runs the Maternal Infant Studies Center at the University of Puerto Rico hospital, which was established 30 years ago to help women living with HIV. Zika, she says, presents some of the same challenges for pregnant women. Zorrilla also compares the impact of Zika with that of rubella, which caused birth defects in tens of thousands of children in the U.S. until a vaccine was discovered in the late 1960s. Years later, Zorrilla says, researchers checked back with adults who had been born to mothers infected with rubella but who appeared normal at birth. "They found an increased rate of schizophrenia and bipolar disorders in these people who were exposed to rubella while they were in utero," she says. "So, it's not until 20 years from now that we might say, 'Oh, Zika caused this or that.'" With the rainy season approaching, the time when disease-carrying mosquitoes become active, Zorrilla worries many on the island have become complacent. One problem, she says, is that women who have babies with birth defects have been reluctant to go public because, like HIV, Zika carries a stigma. Zorrilla has heard comments like, "Oh, you were not protecting yourself?," "You were not using the mosquito repellent?" or "You were not using condoms?" "You have pregnant women with a viral disease that may cause birth defects which is serious," Zorrilla says. "And then you're blaming them for getting it." That's how Yalieth Gonzalez felt when she found out she was infected with Zika. Concerned she would be judged, at first, she only shared the news with her mother and the baby's father. Her daughter Micaela sees the pediatrician every month to check her development, head size and other benchmarks. Doctors are also monitoring the baby's vision and hearing. It all looks good now, but it could be years before any anomalies are identified. It was only after Micaela was born that Gonzalez says she felt strong enough to share her story with friends. "People should know that Zika is real. I was lucky that my baby was born healthy. There are many people in Puerto Rico who don't take Zika seriously, and we should," she says. Epidemiologists expect to see fewer cases in Puerto Rico this year than last, but the disease is now endemic on the island. That means, until a vaccine is available, Zika will continue to pose a risk for women who become pregnant, and for their babies. Puerto Rico is grappling with a severe Zika outbreak. We still don't know how many people have been infected since the mosquito-borne virus appeared on the U.S. territory more than a year ago. Nearly 40,000 cases of Zika have been confirmed. But doctors warn many more may have gotten infected without knowing it. And among those confirmed cases, more than 3,000 pregnant women. We're going to hear from NPR's Greg Allen now. He reports that doctors in Puerto Rico are just beginning to assess the long-term consequences for children born to mothers with Zika. GREG ALLEN, BYLINE: Micaela Delgado is a beautiful, dark-eyed baby girl with a ready smile, just 8 months old. 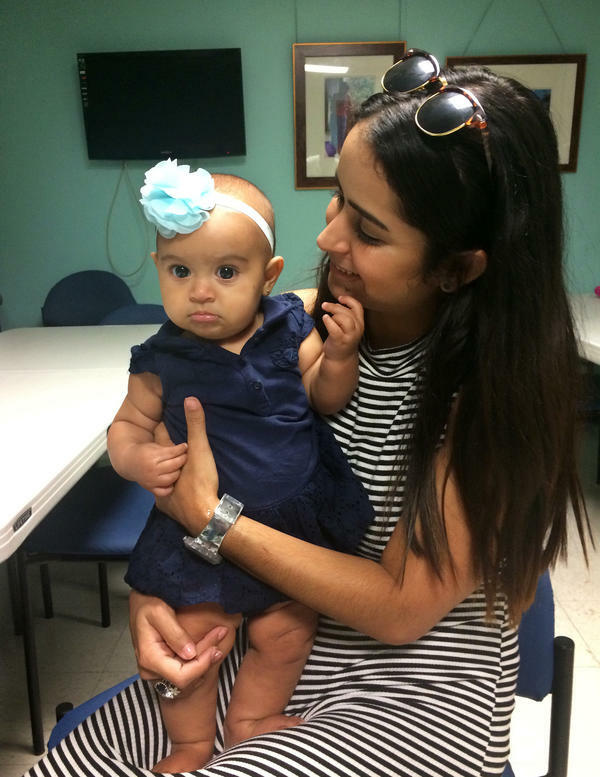 She's one of more than a thousand babies born in Puerto Rico to mothers with Zika. Her mother, 22-year-old Yalieth Gonzalez, says despite all her worries, so far, Mckayla's development appears normal. YALIETH GONZALEZ: (Through interpreter) She's very active. She's up on her own now. She's crawling. She's already saying mama and papa. She's a very happy baby. She has a lot of energy. ALLEN: Gonzalez doesn't know how she got Zika. She was just three months pregnant when she had symptoms and went to the hospital. Zika was new in Puerto Rico at that time. But the more she heard about the disease, the more Gonzalez worried. Doctors monitored her baby's development with regular ultrasounds and warned her about the possibility of birth defects. The worst part of her pregnancy was when it came time for her delivery. Gonzalez says she was in labor for 22 long, agonizing hours. GONZALEZ: (Through interpreter) What would I do if she was born with health problems, I thought. I was young. What would my life be like? I wanted to see her, but at the same time, I was scared, scared of how I would feel if she was born with medical problems. ALLEN: Gonzalez was treated here, at the High Risk Pregnancy Clinic at the University of Puerto Rico's hospital. Dr. Alberto de la Vega has seen a fifth of the more than 3,000 pregnant women on the island who tested positive for Zika. ALBERTO DE LA VEGA: Among those patients, we've had at least 14 or 15 confirmed cases in which severe brain damage caused by the Zika virus has occurred. ALLEN: Some of those cases included microcephaly. For babies born to mothers infected in the first trimester, de la Vega says the risk of brain damage is between 2 and 4 percent. But he's seeing many other problems in his patients infected with Zika, including mothers going into premature labor and a higher number of miscarriages. But he says what worries him most is that even in cases where babies appear normal, their brains show lagging growth. DE LA VEGA: What does that mean in terms of future development? No one has an idea. If you have a condition that can cause severe brain damage, it's not going to be an either-or situation. This has to be a spectrum of problems that are yet to be defined. ALLEN: Puerto Rico's health department plans to monitor the children for three to five years. Many are being seen at the University of Puerto Rico by Dr. Carmen Zorrilla. She compares the impact of Zika with that of rubella, which caused birth defects in tens of thousands of children in the U.S. until a vaccine was discovered in the late 1960s. Years later, Zorrilla says, researchers checked back with adults who had been born to moms infected with rubella but who appeared normal at birth. CARMEN ZORRILLA: They found an increased rate of schizophrenia and bipolar disorders on these people who were exposed to rubella while they were in utero. So it's not until 20 years from now that we might say, oh, Zika caused this or that. ALLEN: With the rainy season approaching, the time when disease-carrying mosquitoes become active, Zorrilla worries many on the island have become complacent. One problem, she says, is that women who have babies with birth defects have been reluctant to go public because of the stigma of the disease. ZORRILLA: Oh, you were not protecting yourself. You were not using the mosquito repellent. You're not using condoms. So it's sort of like they feel responsible. So you have pregnant women with a viral disease that might cause birth defects, which is serious. And then you're blaming them for getting it. ALLEN: That's how Yalieth Gonzalez felt when she found out she was infected with Zika. At first, she only shared the news with her mother and her baby's father, concerned she would be judged. Micaela sees her pediatrician every month to check her development, head size and other benchmarks. Doctors are also monitoring the baby's vision and hearing. It all looks good now. But it could be years before any anomalies are identified. It was only after Micaela was born that Gonzalez says she felt strong enough to share her story with friends. GONZALEZ: (Through interpreter) People should know that Zika is real. I was lucky that my baby was born healthy. There are many people in Puerto Rico who don't take Zika seriously. And we should. ALLEN: Epidemiologists expect to see fewer cases in Puerto Rico this year than last. But the disease is now endemic on the island. That means until a vaccine is available, Zika will continue to pose a risk for women who become pregnant and their babies. Greg Allen, NPR News, San Juan, Puerto Rico. Transcript provided by NPR, Copyright NPR.